Morrissey's first dates promoting his "Your Arsenal" album was through a handful of European summer festivals. Two of these dates ended up being cancelled. These appearances in front of fans as well as non-fans, featuring mostly yet unreleased new material, served as some sort of rehearsal for the upcoming lengthy North American and UK/Europe tours, scheduled after the release of the album. The fiasco at London's Finsbury Park on 8 August gave Morrissey a lot of media attention during the months that followed. This mostly negative attention had little effect on ticket sales in the USA and Canada. But in England the crusade led by the NME had a great effect on Morrissey's reputation and ticket sales for the British leg of the "Your Arsenal" tour, which only ended up lasting 10 days. Personnel: Boz Boorer (guitars), Alain Whyte (guitars), Gary Day (bass) and Spencer Cobrin (drums). Non applicable. 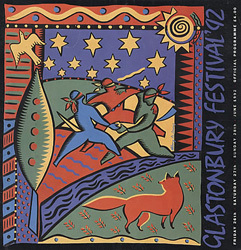 Morrissey was just one of many artists featured at these festivals. 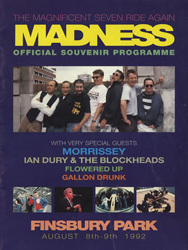 However Gallon Drunk who would open for Morrissey later on this tour were added to the Madstock bill at Morrissey's request, replacing The Farm who had originally been scheduled to play before him. - A white t-shirt showing the "We Hate It When Our Friends Become Successful" single artwork was sold in Belfort and at the Madstock festival, and perhaps also in Leysin (view). - The programme sold at the Madstock Festival mentioned Morrissey (view). - Although Morrissey cancelled his planned appearance at the Glastonbury festival, it was too late to make corrections into the festival's programme so it features bits about Morrissey (view). - There may have been more merchandise than this, in which case information is needed. Klaus Nomi's "Wayward Sisters" song was played just before Morrissey took the stage. There must have been more before that, full information is needed. In Belfort Morrissey sang in front of a backdrop of Charlie Richardson that would mostly be used on the following legs of this tour. At Madstock he used a cropped (heads and shoulders only) image of two skinhead girls by Derek Ridgers (view full original or in situ). Information is needed for Leysin, but it is possible that the stage there did not make it possible for artists to have their own backdrop. These few dates saw the live introduction of most of "Your Arsenal". Of that album's 10 songs, only "I Know It's Gonna Happen Someday" and "Tomorrow" were not played. The latter was on the planned setlist in Belfort, but it was skipped for some unknown reason. It would make the setlist on the upcoming North American tour. Surprisingly, nothing from "Kill Uncle" made it into the set. 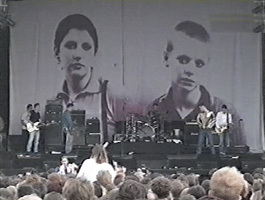 However many songs found on "Bona Drag" were performed, such as early singles "Suedehead", "Everyday Is Like Sunday", "November Spawned A Monster", "The Last Of The Famous International Playboys", "Interesting Drug", and "Piccadilly Palare" as well as b-sides "Sister I'm A Poet" and "Disappointed". "Viva Hate"'s "Alsatian Cousin" and b-side "The Loop", both previously played on the Kill Uncle tour, completed the setlists. Two b-sides which had not been played on the previous tour were added to the set, "Such A Little Thing Makes Such A Big Difference" and "Girl Least Likely To". The former had already been collected on "Bona Drag", but the latter was unknown to fans who didn't buy singles. The biggest surprise was the cover of Suede's "My Insatiable One", always performed at the end of "Such A Little Thing Makes Such A Big Difference". Suede was at the time relatively unknown, having released only one single. Songs that had previously been played on the Kill Uncle tour were arranged differently on this new one. The most notable differences were heard in "Everyday Is Like Sunday" in which Morrissey didn't alter lyrics as much as he did before (except for "scratch on a postcard" which he kept doing) and didn't sing the "When you're on your own" outro lines. Similarly, at the end of "Piccadilly Palare", Morrissey didn't sing the "No Dad I won't be home tomorrow" lines and the song's outro was not as long. "November Spawned A Monster" also sounded different to the way it did on the 1991 tour, with a notably different intro and a clarinet line added during the bridge (except in Belfort). As he did at the end of 1991 when "Sister I'm A Poet" was played live for the first time, Morrissey sang "A plastic bag stranded at the lights, this once was me" instead of the studio version's "Oh no, no, no-no, waiting at the lights, but not this time". In "Girl Least Likely To", he changed a line to "We do think this but we cannot say it to the girl least likely to" or "... we can never say it...". Actually throughout the whole song Morrissey occasionally changed the lyrics from first/singular to first/plural, switching 'I's for 'we's. He also rearranged some of the verses, losing six lines in the process. In "Such A Little Thing Makes Such A Big Difference", Morrissey changed the meaning of one of the lines by singing "How I love all of the complicated things of life". At the end of the song, instead of going into the "Leave me alone I was only singing" part, the band went into a cover of Suede's "My Insatiable One". At Madstock, in "You're Gonna Need Someone On Your Side", Morrissey changed the line "Someone kindly told me that you wasted eight of nine lives" to "Someone kindly told me you've collected very sharp bread knives" as he would be doing often throughout the upcoming legs of the tour. "The National Front Disco" ended in extended noisy jam with lots of feedback as it would always when played live. 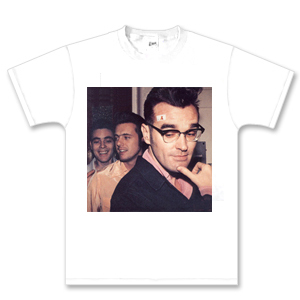 In it, Morrissey skipped the "When you've settled the score" line. Nothing from these dates has been made available on official releases at this point in time. An audience recording of the complete Madstock show is circulated on bootleg DVDs as well as in digital format on the internet. The filming was done from the left and is rather steady. It has occasional head obstruction. One of the more popular audio bootlegs for this section of the Your Arsenal tour is the manufactured bootleg cd "Dreams I'll Never See". It features the full Leysin concert from what is usually assumed to be a radio broadcast, but is actually a good audience recording. There is a radio broadcast bootleg out there for that concert, but it only features a 10-song subset and the quality is not better than the audience recording. The set in Leysin only featured four songs from the upcoming "Your Arsenal" album, so collectors might prefer the reasonably good audience recording of the Belfort concert which featured eight songs from the newest album. This is occasionally available under the title "Belfort 92". A partial radio broadcast of 5 songs from this concert is also out there, but again, the quality is not what would be expected from a radio recording. Finally, a fair sounding audience recording of the aborted Madstock appearance is also circulated on bootleg cds and on file sharing networks. However the set is short and the recording is from the audience, so it will be of interest only to completists.